Chickens, Kings & Sportsmen. 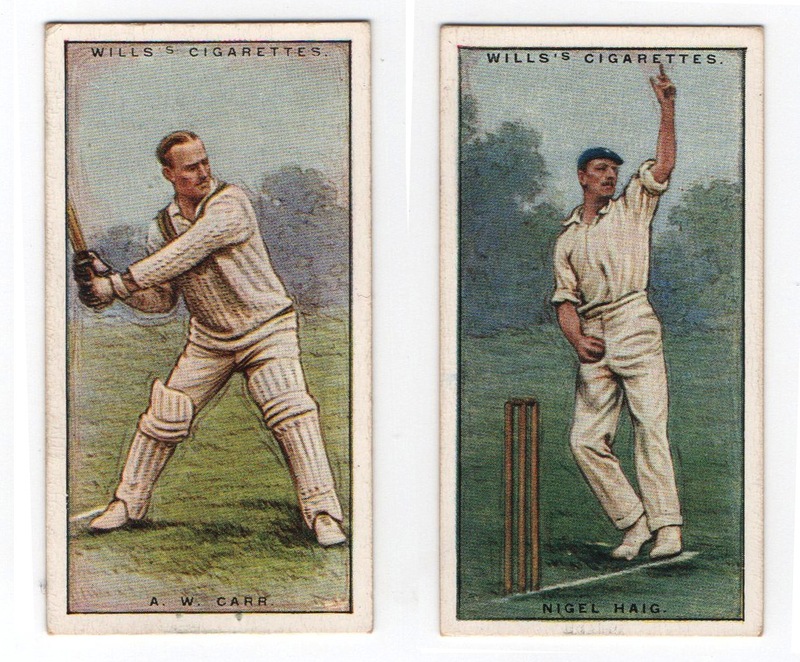 The illustrated cigarette card. collect a lot of what many might call junk. One such part of this collection is the gathering of printed ephemera, both old and new. Most of it gets put into bags and box files and remains largely hidden until used to illustrate a lesson topic or taken out simply to be poured over. Most of this stuff was never meant to be kept, maybe referred to or utilised for a brief moment in time, and then disposed of. Much of the stuff that I hoard ranges from old village maps, museum/exhibition guides, tobacco tins, printed paper bags and so on. Essentially it’s rubbish, but with age this can become interesting rubbish. These interesting and frequently overlooked little items are stylistic snapshots of an era’s advertising, promotional activity and social interests, and as a designer, the typography and illustrations are often as striking and imaginative as anything made today. My father who died in 2008 amassed a huge collection of one very specific form of printed ephemera, namely the cigarette card. I subsequently inherited several boxes full of albums and quite literally thousands of cards. I remember my father spending hours sorting his card collection into very neatly kept albums along with buying and selling them. I recall him telling me that when he was a boy in the 1940’s and early 50’s, he and his friends would play games with such cards. The boys would put a card against a wall and each boy would take it in turn to attempt to knock the card down by flicking another card at it. The boy that managed to knock the card down got to keep all of the cards that had been flicked. Schoolboys had obviously not flicked around most of the cards in my father’s collection, as it is mostly immaculate. I remember looking through the albums with interest. More recently I spent some time looking through the albums again, and appreciating just what a huge industry this was, and also how talented many of the illustrators were, and most of whom I know nothing about. 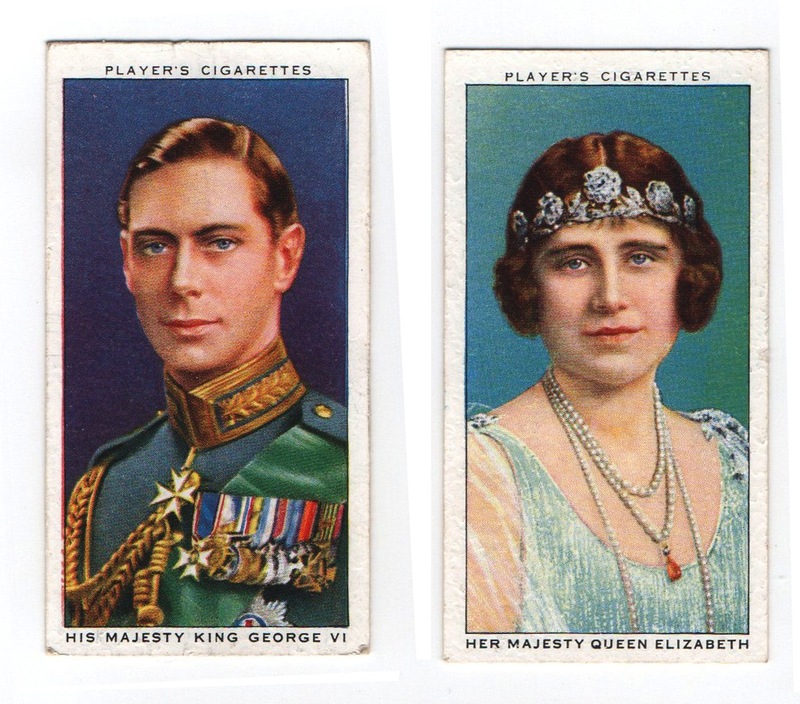 In their earliest form the cards were simply blank and used to stiffen the cigarette pack. Later on manufacturers put adverts on them. (Rickards, 2001). However, as the content evolved into themed sets, they started to be collected and kept, and therefore I guess with that in mind they might not be considered as being printed ephemera? 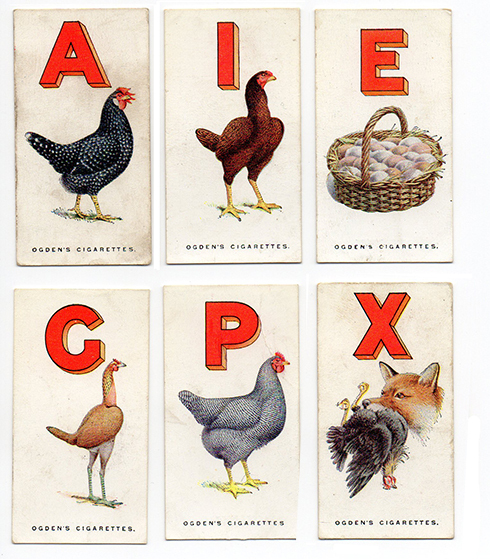 More than that, someone had to come up with new themes for each collection, and though some of these themes are fairly predictable, such as ever-popular themes like cricketers, footballers, actors, king & queens, etc., many of my favourites are some of the quirkier topics such as this one of from the card manufacturers, Ogdens, called Alphabet Poultry. The reverse of the cards. As I mentioned, I know very little about the illustrators who worked for the cigarette card companies. So if anyone has any information that they’d be willing to share, I’d like to know about more these artists. I do wonder if it was a something that was considered as ‘bread and butter’ work for artists, and perhaps it was work of which artists and illustrators didn’t want to admit to doing. There’s no evidence to suggest this was the case, but I do know of comparable professional outlooks within today’s illustrative world. I have a friend who is a very accomplished story boarder for film and advertising who has mentioned that quite a few illustrators of good repute occasionally take on story boarding to supplement their income when work is tight, but they don’t tend shout about taking on work that they view as being a lesser form of illustration compared to book or editorial illustration. I can’t see that would be the case with cigarette cards (or storyboarding for that matter) as many of them are incredible pieces of work. Either way, successive generations of people like me have held onto these curious miniature works for more than a century and will no doubt continue to enjoy them. Left: Ogden’s ‘Birds Eggs (1908)—with perforations to push the egg out.